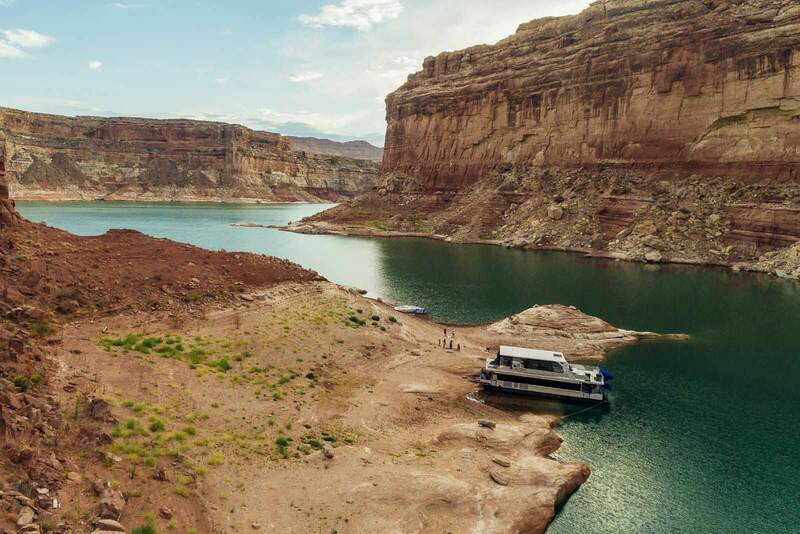 This guide for Lake Powell houseboat rentals will help you plan your ultimate vacation surrounded in some of the most beautiful landscapes the United States has to offer. 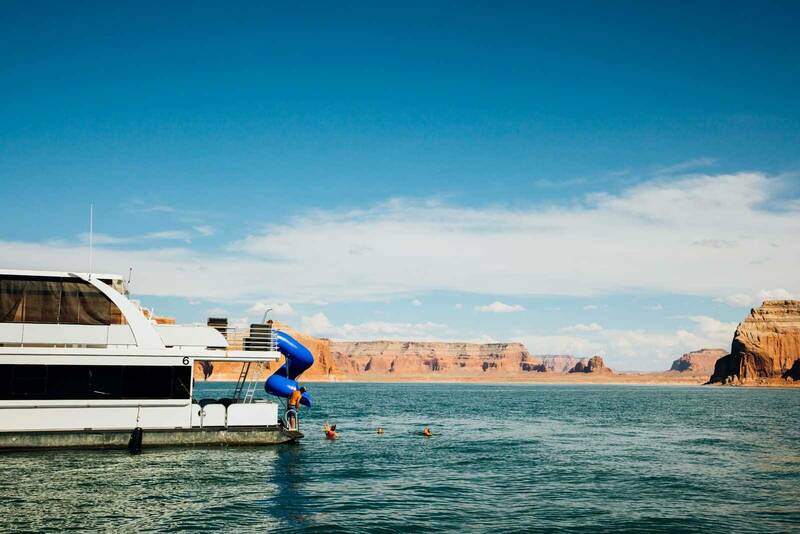 We go through the steps of how to book and plan your Lake Powell houseboat rental in this guide to help make planning your trip a breeze. 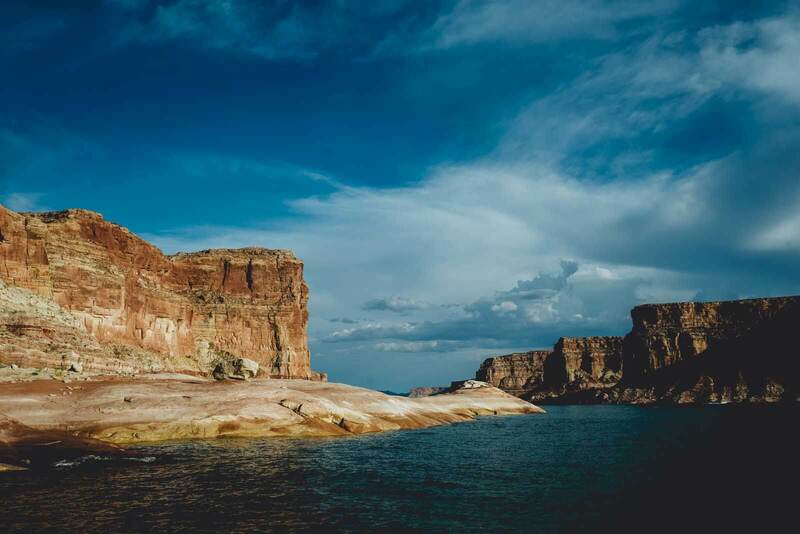 Located on in the reservoir of the Colorado River bordering the states of Utah and Arizona, Lake Powell is a dream destination for houseboat rentals. Imagine spending every day in the beauty of some of the best sweeping landscapes in the United States, sleeping under the stars, floating through the gorgeous canyons, and waking up each morning in complete solitude surrounded by natural beauty. Lake Powell is a part of the Glen Canyon National Recreation Area which is a conservation and recreation unit under the guidance of the US National Park Service. When heading to Lake Powell you may want to schedule in extra time to do an Antelope Canyon Tour, visit Rainbow Bridge National Monument from your boat, or check out the amazing view from Horseshoe Bend near Page, Arizona. 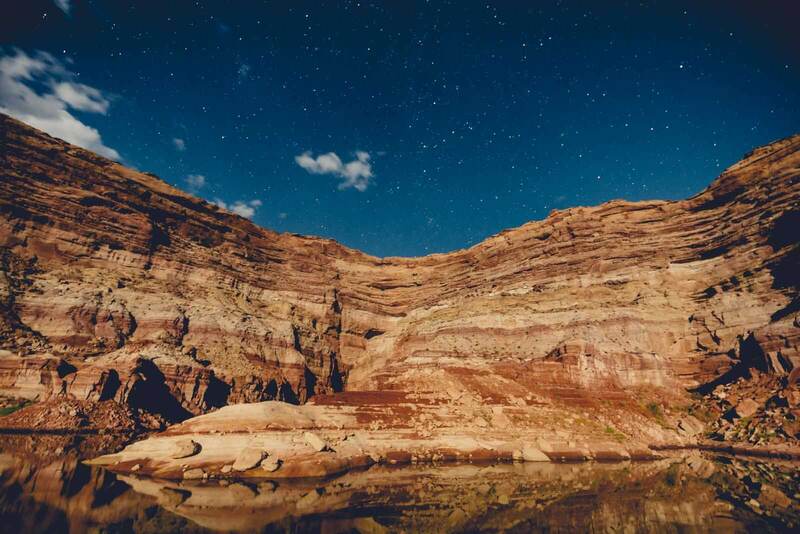 These are just a few of the more famous natural wonders that make up the area and doing a Lake Powell houseboat rental is the best way to explore and take in the beauty of the area. 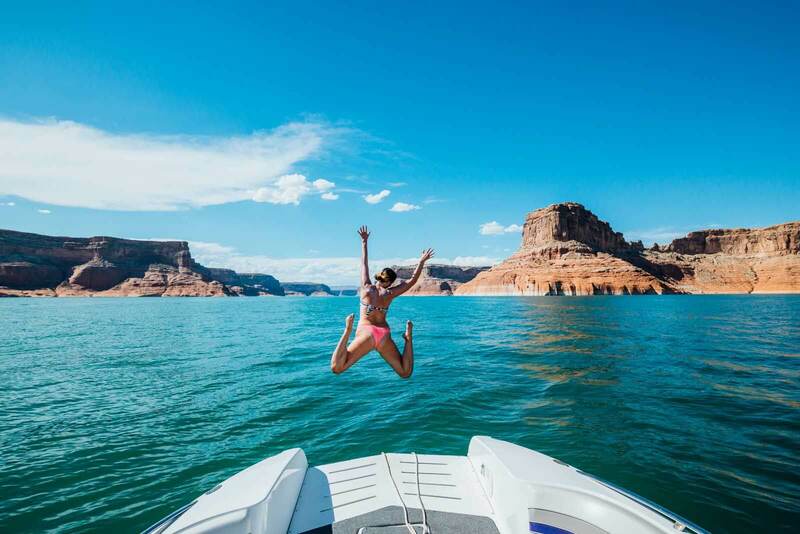 This guide for Lake Powell houseboat rentals will cover how far in advance you should book your Lake Powell houseboat rental, how to shop for your Lake Powell houseboat rental, extra costs to plan for with your Lake Powell houseboat rental, what to pack for your Lake Powell houseboat rental, and tips for your Lake Powell houseboat rental. -Off Season is January 1-June 20 then again in August 20-December 31, if you’re able to you can save alot of money by visiting on the shoulder season as the rentals are half the price during these periods. -Some Lake Powell houseboat rentals are as little as 3 days up to 7 full days. You can choose depending on the time of year and boat, most people book for at least 5 days and we recommend giving yourself all the time you can on your Lake Powell houseboat rental. -Anyone who is over the age of 18 with a valid driver’s license can drive the boat. Before leaving the marina a staff member of the Lake Powell houseboat rentals will teach you how to operate the boat. This is the most essential thing you need for a Lake Powell House Boat rental, actually having a boat. We recommend booking at least a year in advance if you’re planning on visiting during the peak season which is pretty much June through August. For off season you will have more flexibility, be sure to check the weather too. For example, in April the average air temperature is a high of 68 degrees with lows of 43 degrees. That means you won’t get to enjoy many of the water sport or activities and you will have to plan your trip a bit differently for the colder temperatures. Not bad but one of the things you pay for during peak season is enjoying the prime time to do water sports and activities. You can book your Lake Powell houseboat rental online or call 888-896-3829. Lake Powell houseboat rental will cost. There are different models of boats that hold different capacities of people and the prices dramatically change during peak season. During peak season you can expect to pay as little as $2k – $15k for the luxury boats, our boat was $7500 and can sleep up to 12 people. During the off-season, you can expect prices to be about half of that. Renting the houseboat is the first step, but your cost doesn’t stop there. You must factor in insurance if you want to be covered, fuel for giant gallon size boats, and of course groceries. Your gas prices on your Lake Powell houseboat rental depends on the size of the boat, we had two 300 gallon fuel tanks on our 59 ft boat costing around $1300 to fill up and we didn’t use all of the gas. We also had a speedboat with us that used about $600 in gas during the trip. This will all vary on your travel style if you decide to have jet skis, boat, a big boat, move around a lot, but you should overestimate your costs on the gas just to give yourself a safety net in your budget. This part is very tricky, our group came with a TON of food and thought we’d be in vacation mode and grazing the snacks all day. It turned out we overbought and many people went home with groceries. You should definitely plan your meals ahead and shop accordingly for how many people you have. We ended up eating less than usual on this trip for some reason! Your boat will have a full but tight space kitchen, so you can take advantage of it. Be sure to bring extra coolers for any food that might not fit in the fridge, however, we were able to store cold food for 10 people in our fridge easily, we kept all our beverages in the coolers instead. We recommend buying things in bulk and buying premade meals like lasagna for example since there’s minimal effort to cook. Other great products to bring are cartons of egg whites rather than eggs since they can break loading the boat and moving around, sandwiches, and other premade meats. Our boat also came with a grill. To make things easier for you try out buying your groceries online and having them delivered to you! That is what our food leader Shawnee did to save herself some trips to the store loading and unloading groceries. There’s also a Walmart in Page, Arizona. This is extremely helpful because you can grab any last minute things here OR if you flew in you can do all your grocery shopping here and it’s not far from Wahweap Marina. We recommend being very organized with your meals and planning them all out and getting all your groceries in one go with a very neat grocery list by section. No need to go crazy buying bottled water, the boat offers filtered water using reverse osmosis. Bring a refillable water bottle and just use that, you save space, money, and use less plastic taking advantage of this. If you’re still nervous about drinking the filtered water we recommend getting a SteriPen, we travel with one and it uses UV light to kill bacteria in your water. We recommend bringing a few jugs of water or at least one big pack of bottled water as the running water isn’t on when your boat is in motion and moving. This way you will have some water if you forgot to fill up your bottle before heading out. Don’t want to pack food/cook yourself? You might feel like being in full vacation mode. Don’t sweat it, you can do a meal delivery service or if you leave from Wahweap Marina you can pay an extra fee for a chef on board who follows your boat on another boat nearby ready to cook whenever you need it. Make sure you pack enough booze to get you through the week, we planned out some of our favorite mixed drinks and beers ahead of time. We highly recommend avoiding glass on the boat though, we did have some bottles and one broke the first day making it a nightmare to pick up and I even cut my foot. Since you are in a dry arid climate be sure to pack something to rehydrate with electrolytes. We had these liquid IV packets that we added in our water bottle once a day to help us stay hydrated. While you absolutely don’t HAVE to have a speedboat or jet ski, there are tons of perks to having one. Your Lake Powell houseboat rental is more of a base, any water activities you want to do will have to be done on a speedboat or jet ski. Also, when you’re looking for a place to park your Lake Powell houseboat rental you might want to send someone with a jet ski or boat to go scout for locations not to mention ice and garbage runs to the different marinas, exploring the nooks and crannies of Lake Powell, and if there’s anything you need it’s easier to get on a smaller boat. However, if you don’t bring your own they are very expensive to rent from Lake Powell houseboat rental place. We scoffed at the price of renting 1 jetski, it was going to be about $900 for the week, that’s almost the price to buy a used one and that doesn’t include gas. Our brother luckily had a boat he brought, this saved us a ton. Decide what you want out of your trip if you’re completely fine just chilling on the big houseboat then no need to add on that extra expense. But if you want the flexibility and convenience and fun of other activities, refilling your ice for the week, and dumping off trash you will want to consider adding this into your expenses and planning for it. This was one of my biggest concerns as we brought a lot of groceries and it felt like we would be living on a waste barge if there was nowhere to drop off trash somewhere throughout the week. Luckily, there are trash compactors and collectors at the various marinas throughout Lake Powell. 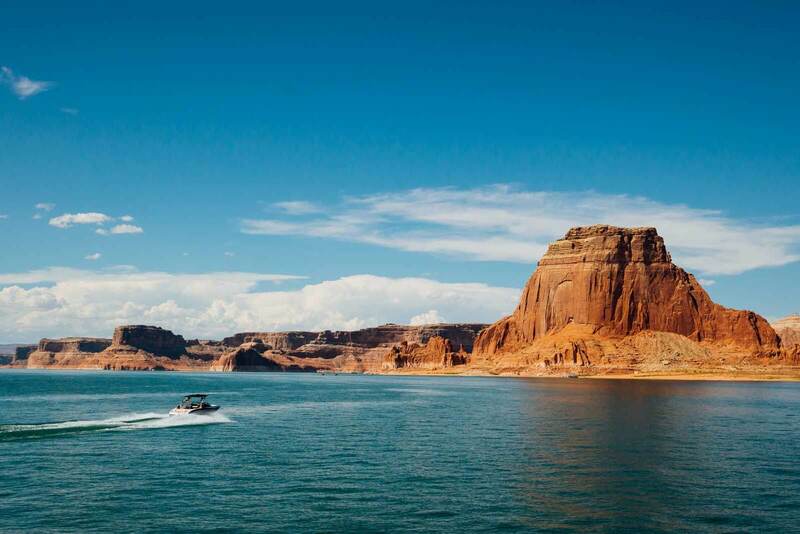 You will need a map, they will provide one when you pick up your Lake Powell houseboat rental and make sure you plan your trash drop-offs with marinas. Need to get more ice for your drinks? You will have to make ice runs to the different marinas. We made two ice runs throughout our 7-day trip starting our trip with fully loaded and cold coolers. Make sure you factor this in your budget, they charge about $5.50 for a 10 lb bag of ice which adds up if you have multiple coolers. Sorry, no wifi at the marinas or on your boat. Chances are you won’t have cell service either, some people that had Verizon received random service in the most random places. Everyone with AT&T and T Mobile had no such luck. If there’s an emergency or your boat needs repaired or is stuck you can use the radio on the boat. I didn’t realize we had one and was worried if something happened (we had kids traveling with us) that we wouldn’t be able to contact help. No worries though, there is a radio. Fishing is permitted at Lake Powell you will need to get a fishing license since most of the houseboating in Lake Powell is in Utah we recommend getting this one. You can find an up to date fishing report in the area at Wayne’s World. There are two different marinas that the Lake Powell houseboat rentals take off from, Wahweap Marina in Arizona or Bullfrog Marina in Utah. Wahweap is the largest Lake Powell houseboat rental marina and also offers a resort if you come in a day early or are exhausted when you get off the boat and need a place to stay before driving/flying home. Bullfrog Marina offers less Lake Powell houseboat rentals from this starting point but is a great spot to start if they have your houseboat and you’re already coming in from North Lake Powell. You will either want to drive to Lake Powell or fly into Lake Powell. If you need to get to Wahweap Marina you’re the closest city is Page, Arizona which has flights coming in from Phoenix and Denver on Great Lakes Airlines unless you have a private plane. For Bullfrog Marina you either have to drive or use the private landing strips in Bullfrog or Halls Crossing, Utah. Tip: If you’re driving into Lake Powell chances are you had a long journey ahead of you. We recommend coming in a day early and sleeping at Lake Powell Resort at Wahweap Marina. This way you will be down at the dock bright and early for your 10 am checkin and you will have had a full night of sleep. Everyone in our group did this except for us and it took us two nights to catch up on our sleep and our first day we were in a haze. We also recommend staying the night the day you return your boat. Most boats are returned around 3:30 pm and by the time you unload your stuff and return the boat its already 5 pm. Make the most of your trip and enjoy your last day on the boat by not worrying about driving home. We drove through the night home and wish we would have stayed the night. If you don’t have a pressing schedule and have time on your way home can stop and do an Antelope Canyon Tour or visit Horseshoe Bend right by Page, Arizona since they are all right there! You’re also just a 30-minute drive away from Grand Staircase-Escalante National Monument! Note: If you want to visit Antelope Canyon, the iconic photo spot, you have to do so by going on a tour. 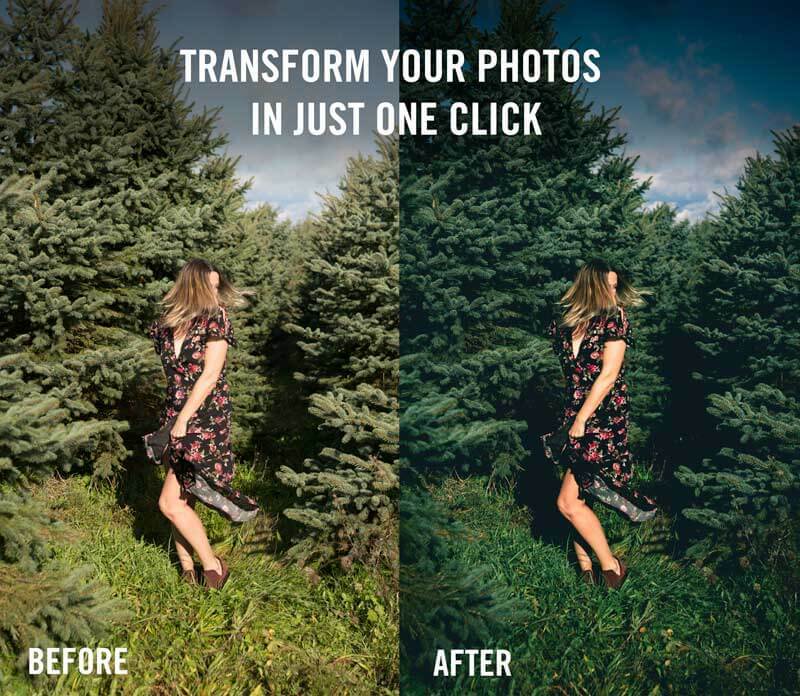 No DIY trips are possible. You can book a tour to Antelope Canyon in advance here, notify the tour company that you’re already in Page and they will arrange for you to join the group. Once all the hard work from planning your trip is all done you will finally get on the water. Before you leave your marina you will go through about a 30 minute tutorial on how to use the boat as well drive it. This is important to have any of the adults over 18 to listen to if they plan on driving the boat. You will want to make sure you do not leave without a map. The Lake Powell houseboat rental should provide one, but it’s better to have more than one in case a gust of wind takes away your map. You can buy a second map like we had here. Navigation: You can navigate easily through Lake Powell following the buoys with numbers marked on them. You will want to reference your map to make sure you’re going where you want to go. Bring: Binoculars so you can see the numbers on the buoys from a further distance. This one has high ratings on Amazon. 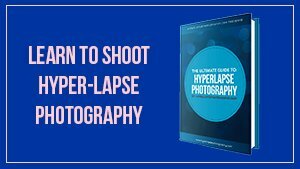 You will want to gauge your distance the first day to see how long it takes you to get to certain areas. 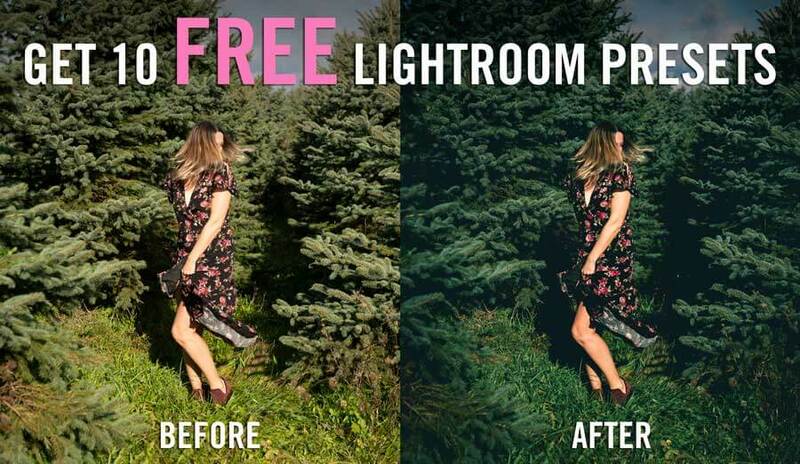 This will help you time your return back alot better. You will want to look for a place to camp and park your boat for the next night, or two, or three depending on what you find. This is where having a jet ski or a speedboat comes in handy to go ahead fast and find a spot. You will want to go through the various canyons to find a sandy beach to park your boat. You do not anchor your boat in the middle of the water, you park it on a sandy shore. Finding a good spot can be competitive in peak season. Do not wait until it’s too late in the day to find a spot. We recommend finding a spot on your first day by 3-4pm so you have plenty of time to find a spot if you’re running out of time. We found several beaches that were perfect but had someone there waiting for their Lake Powell houseboat rental to arrive. Someone even came looking for a spot where we were parked after dusk! They were in a stressful situation, prepare for your parking spot! We stayed at each of our spots for a few days, you could move every day but it is a bit of a hassle. We made sure we found cool beaches to park that were private, had a place to play on the land, and good swimming spots. The place is FULL of spots like this, you just have to be patient and nab an empty one you like when you see it. Remember that the further you go through Lake Powell, the more fuel you’ll use. You may also want to make sure you’re never a super far distance from one of the many marinas scattered throughout Lake Powell in case you need ice/gas/emergency supplies. Tip: During our trip in July we experienced daily gusts of wind in the late afternoon, this sometimes led to rain sometimes didn’t. It’s important to be ready for the wind as you will want to make sure your inflatable floats, beach towels, and any loose items on your boat are secure or inside to avoid losing them. Be mindful of your trash as well as if it blows into the lake without anyone noticing it will sink and pollute the water. Most places mentioned below are actually best visited from an additional speedboat or jet skis and not from your Lake Powell houseboat rental. 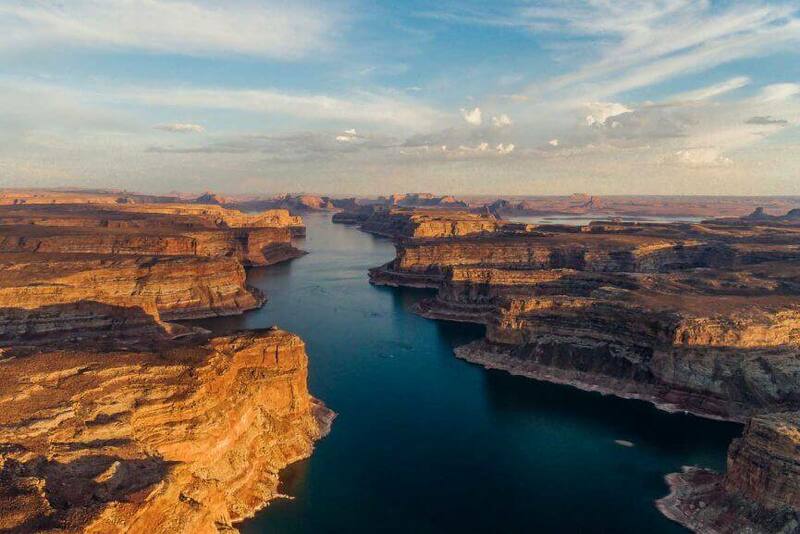 There are several great stops in South Lake Powell, our favorite one we made it to is Rainbow Bridge National Monument which is an easy point of interest to get to by boat with a map otherwise it’s about a 15-17 mile hike to visit this monument coming from inland, yikes! This is also the world’s largest natural rock bridge! Other points of interest include Padre Bay which you’re most likely going to pass through on your way to your camping spot. This is a good spot to do any water sports and also enjoy views of monuments such as the different Buttes that make up the surrounding landscape. Navajo Canyon is another amazing side attraction and one we missed on our trip. This is the longest of the side canyons that run off of Lake Powell. You can adventure back on the 15.5 miles of twisty turns of the canyon for an unbelievable and unique experience in Lake Powell. You will need a speedboat or jet ski for this one. Gunsight Canyon is located near Padre Bay and a great spot to park your Lake Powell houseboat rental if you have no idea where to go. There are 2 miles of sandy beaches here, monuments in the distance, and Gunsight Butte who’s shadow casts the perfect shade to give you a break from the hot summer sun. Sadly there just wasn’t enough time in one trip to see it all or even make it up to North Lake Powell on our Lake Powell houseboat rental. Things we’d be interested in visiting next time around in include the Cathedral in the Desert on the Escalante Arm of Lake Powell. This is only accessible by small boat, kayak, or jet ski and it takes you to a magical narrow grotto to explore with a hole in the ceiling letting the light shine down and depending on the weather there could be a waterfall. The Escalante Arm River is perfect for kayakers and Forgotten Canyon is one of the most unique spots you can visit from your Lake Powell houseboat rental as it has 700-year-old ruins built into the rock walls you can hike to with ancient wall murals! Another great hike is Hole in the Rock, this hike takes about an hour and a half and leads you to the historic man-made site dating back to 1880 where Mormon pioneers were looking to pass through Escalante to Montezuma. There were over 200 people and they were stuck and spent 45 days blasting a hole in the rock, hence the name, to make a passageway for their horses, wagons, and people which you can still see today. LaGorce Arch in Davis Gulch is another cool spot in North Lake Powell. When the water levels are higher you can take your small speedboat or jet ski right under the archway. This is also a great area to park the boat and hike or even camp. 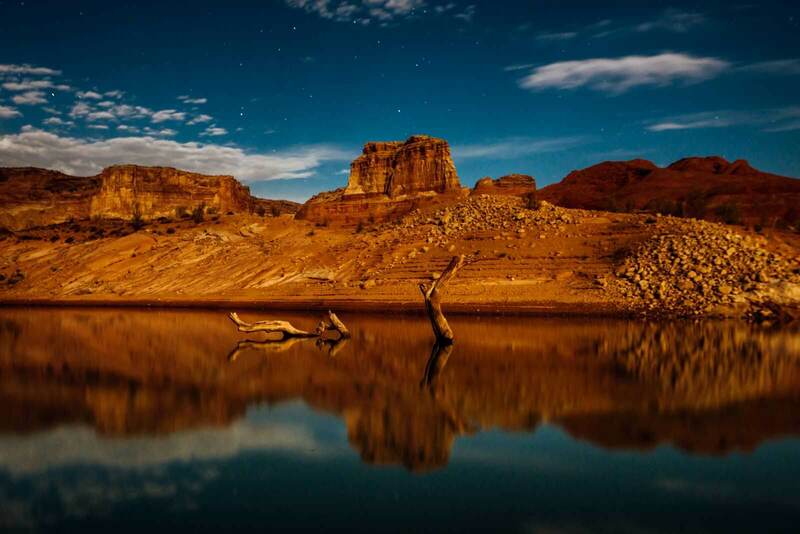 Another must see in North Lake Powell is Moki Canyon and easily explored with your Lake Powell houseboat rental. These narrow, steep canyons are where the Native Americans of the area lived hundreds of years ago. Don’t miss out experiencing the Anasazi ruins and petroglyphs you can see here. 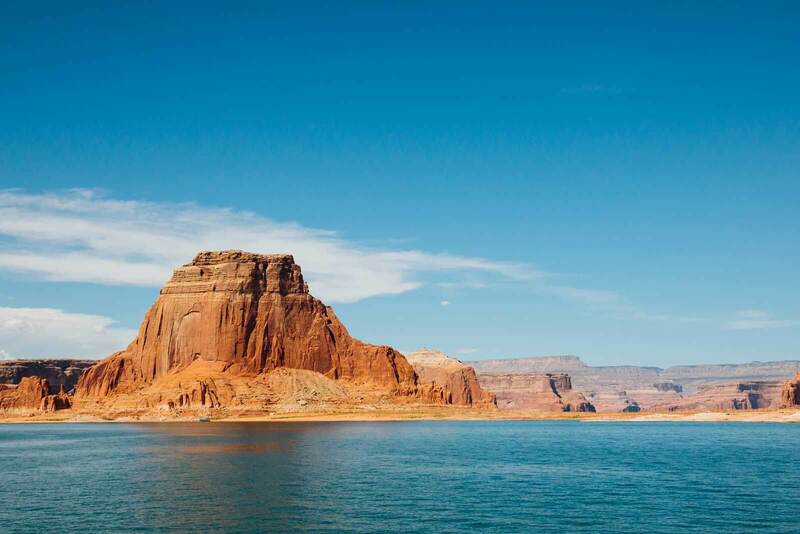 Besides the obvious groceries and personal toiletries you’d take on any trip away from home we put together a mini guide of things you’ll want to make sure you also bring that are easy to forget but are essential to have during your Lake Powell houseboat rental. 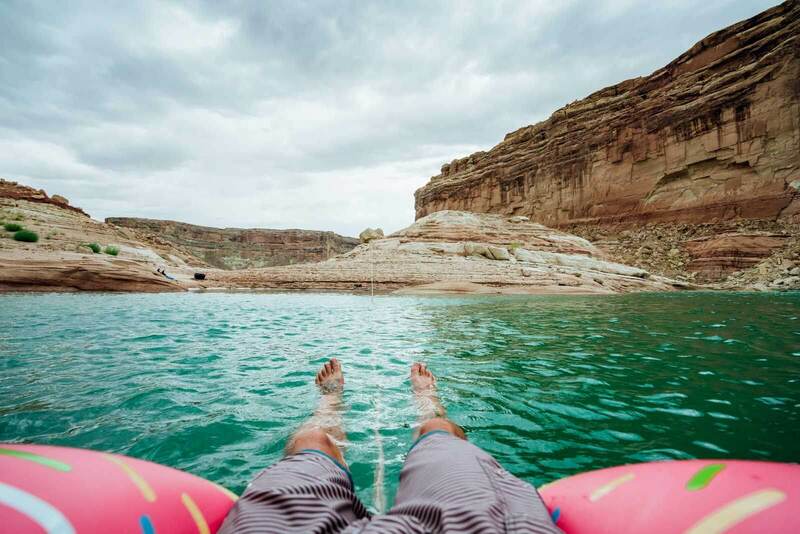 Don’t forget a great float to relax on while your Lake Powell houseboat rental is parked! We brought several and used them everyday. Whether you’re with all adults or you have kids it’s important to bring some games for entertainment in the evenings! We brought Cards Against Humanity for the adults and had some board games and playing cards for the kiddos, this is also a perfect way to wait out those daily gusts of winds and rainstorms that happen in the late afternoons. The Lake Powell houseboat rentals come with a flatscreen tv and dvd player, at least ours did. You can check the specs of your boat to double check. This was great for the kids, and the adults when we needed the settle the kids down. Movies are also a great way to kill time during any unexpected rain. As mentioned earlier, we recommend taking advantage of the filtered water on the Lake Powell houseboat rentals. This saves you from having to buy bottles of water and create less trash. You will want to bring a few, we even had water bottles to make mixed drinks in or drink our wine out of since they were easier to float around with in the water. You will be in the sun ALOT so do not come unprepared without sunscreen. We are loving these eco-friendly brands as they are better for the environment. If there’s an absolute emergency and you run out of sunscreen it is available at the marinas. You will be in the sun ALOT so it’s important to bring a good Aloe Vera in case anyone gets a little too much sun. We were very cautious and only got burned on one day, but were so thankful we brought a bottle of aloe for that time. 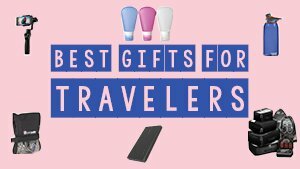 We love dry bags and travel with them all the time. These handy bags will keep your valuables from getting wet and ruined. We always have one when we are on a boat in case of an emergency you can throw your electronics, passport, and other important documents in it. Besides using for an emergency Scott likes to go adventure through the water with his camera and swim to different photo taking spots, he puts his camera in a dry bag to keep it safe while he’s in the water. This is so important! Do not leave on your Lake Powell houseboat rental without a first aid kit. I managed to cut my foot the first day on glass, Scott cut his foot on a rock, and we had various bumps, scrapes, and bruises from being active. Make sure you have a first aid kit for those minor cuts and injuries. This stuff is essential on your Lake Powell houseboat rental as it will keep you hydrated! We found ourselves being extra thirsty and dehydrated in the dry air and climate of the area. Each of us drank one of these Liquid IV powder in our water a day to help us stay hydrated. Each packet is the equivalent of drinking 3 bottles of water plus it is packed with 11 vitamins and minerals. While we are sharing this information on booking a Lake Powell houseboat rental, we owe a huge thanks to our friends and brother Erich, Rebecca, Shawnee, and Dereck who planned our entire trip while we were working on Bobo & Chichi stuff! They shared their valuable information with us and allowed us to join along for the fun! Did we miss anything? Let us know below! If you found this guide on Lake Powell houseboat rentals helpful bookmark for later or share on Pinterest below.